Pain Physicians NY (Brooklyn & NYC) provides a full range of advanced pain management services to help our patients return to a healthy and pain-free life style. We provide the most effective Golfer’s elbow pain relief treatments available. Golfer’s elbow is a medical condition also known as epicondylitis, which is characterized by pain on the inside of the elbow, where the tendons of the forearm muscles attach to the bones. 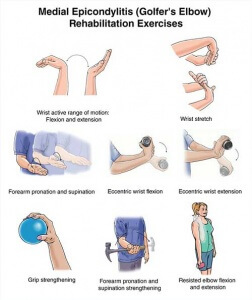 The pain can also spread in the wrist and forearm. Golfer’s elbow is a condition that affects not only golf players. Everyone who uses repeatedly their wrist, everyone who clench their fingers as well as tennis players can develop golfer’s elbow. Golfer’s elbow is caused by damages or injuries to the tendons of the muscles that control the wrist and fingers of the affected arm. 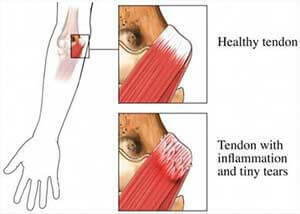 Damages and injuries to these muscle tendons usually occur from repeated stress. Lifting heavy things improperly, throwing or hitting things combined with a poor physical condition and too little warm – up can result into golfer’s elbow. Golfer’s elbow regardless of its name is a medical condition that affects not only golf players. Many different sports activities or not can lead to a development of golfer’s elbow. Playing tennis, football or even archery and weight training put you at a greater risk of suffering from golfer’s elbow. However, any activity that requires a repeated use of the elbow can cause golfer’s elbow. Even things like using a computer, chopping woods, hammering or painting can result into golfer’s elbow. However, keep in mind that it requires more than one day of work to damage the muscle tendons of the elbow and eventually result into golfer’s elbow. Pain on the inner side of the elbow – as mentioned above the pain in golfer’s elbow is located on the inside of the elbow, where the tendons of the forearm muscles attach to the bones. Pain can also spread in the wrist and on the inner side of the forearm. It can appear suddenly, or it can get worse over the course of time. 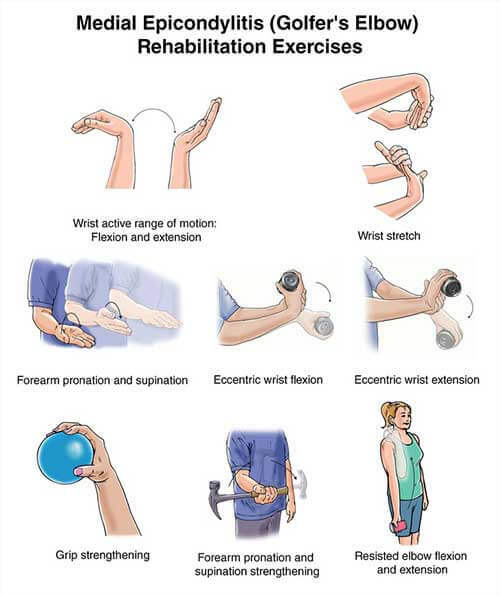 Certain movements of the wrist and arm tend to make this pain worse. Pain usually tends to get worse when lifting weights, shaking hands, squeezing or pinching a ball, turning a doorknob, swinging a golf racket, etc. Tenderness – of the affected wrist and forearm are also very common. Stiffness – is another characteristic sign of the golfer’s elbow. Making a fist may also hurt. Weakness – of the hand and wrist also accompany golfer’s elbow. Numbness and a tingling sensation – accompany golfer’s elbow, but these sensations can also radiate into the fingers. Usually, the ring finger and the little fingers are affected. You should seek medical help every time you notice that your elbow looks deformed, is hot and inflamed, you have a fever and when you can’t bend your elbow. If left untreated, golfer’s elbow can result in chronic pain of the elbow, a contracture of the elbow as well as a limited range of motion of the affected elbow. Golfer’s elbow is diagnosed based on a detailed medical history and a physical examination of the elbow, wrist and forearm of the affected hand. There is no single examination that could diagnose golfer’s elbow. However x-rays or even MRI of the affected elbow, wrist and hand could help your doctor rule out other possible causes of your signs and symptoms like arthritis or fractures. When golfer’s elbow is diagnosed, the treatment should be started as soon as possible, so you could return within a short period of time to your daily activities. One of the most important things in the treatment of golfer’s elbow is resting as much as possible the affected elbow, especially until the pain is gone. Starting to play too soon or even doing other repetitive activities that have resulted into golfer’s elbow can just make the situation worse. Ice packs on the affected elbow for 15-20 minutes couple of times a day can help you recover faster. In controlling pain, over the counter painkillers are recommended. Wearing a counter force brace can help you recover faster, as it reduces the tension on the tendons and muscles of your affected arm. Stretching therapy, strengthening exercises as well as occupational and physical therapy in Brooklyn are also recommended when treating golfer’s elbow. Surgery is needed in very rare cases, usually when the signs and symptoms don’t get better with other treatment methods within a period of 6 – 12 months. Signs and symptoms of golfer’s elbow can sometimes reoccur or even become chronic. Throughout the years, chiropractors in Brooklyn leading by Dr. Lipnitsky has developed unique pain treatment techniques and protocols that combine his advanced eastern European manual therapy skills with his diverse experience in chiropractic rehabilitation medicine to treat some of the most challenging neuromuscular and skeletal conditions. Our Brooklyn pain specialists and chiropractors are best in region. We were selected to be a part of the international medical team for the Rio Olympic Games.